The fun of Feud comes in depicting these two larger-than life Hollywood legends and seeing sides of them we’ve never really seen before. We can read biographies, or watch their movies, but when it comes to the women behind the roles, Feud offers unbridled insight into Joan Crawford and Bette Davis. It’s what makes the key scene in this episode so effective: When Bette and Joan go out for drinks and swap childhood stories. Joan’s is so horrific—depicting a relationship with her stepfather at 11 that exists in her mind as consensual, when there’s no way it could have been—even the usually unflappable Bette is taken aback. Their humble beginnings bely the glamour they grew up to be surrounded by; it adds another dimension as to why they fight so hard to stay where they are, because they remember where they came from. Bette’s calling Joan “Lucille” seems like even more of an affront now, because Lucille LaSouer is likely about the last person Joan Crawford would like to remember. The two women had more in common than they realize, and in one of the worst denouements imaginable. Both were cast as horrific mothers in their daughters’ memoirs: Christina Crawford wrote the infamous Mommie Dearest in 1978, while B.D. Merrill followed in 1985 with My Mother’s Keeper. Bette tells Victor this episode that “The only real legacy is children,” but both of these women have offspring who turned against them absolutely. Crawford’s subtle references to her strict upbringing in this episode only skim the surface of the horror many read, and saw, in Mommie Dearest, a book that has its defenders and detractors among Joan Crawford’s own friends and enemies. We see in this episode why she adopted those children so desperately, due to her almost pathological fear of being alone. Motherhood, to her, offers her a connection she fails to achieve with most people, in an effort to keep her isolating loneliness at bay. Davis, at least, appears to have a valuable connection with B.D., and an interest in the child that transcends her own (even after her daughter’s scathing lambast last week—of course Kiernan Shipka would be able to go toe-to-toe with Susan Sarandon). She can be sympathetic when B.D.’s acting shot doesn’t turn out to be what she hoped. But Davis can also be fickle, and cutting. Henry Mancini’s theme from Charade is an interesting yet peppy soundtrack choice to depict the difference between Bette’s relationship with Victor and with her own daughter. Victor has talent, so in this sibling rivalry, he gets the attention, leaving poor B.D. 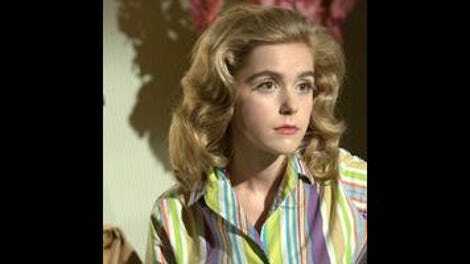 to run her lines by herself (Kiernan Shipka is also amazing at conveying a bad acting performance, when we all know how good she is). “I’m sure his Falstaff is the talk of Tijuana.” Etc. Again we see how Bette and Joan could have been friends: Bette’s almost-dinner invitation last episode, Joan’s phone call to Hedda to try to beg off the story in this one. On some level, it was easier and must have seemed somewhat more logical for them to tear each other down and take their frustrations out on each other. They weren’t going to get anywhere with the Jack Warners of the world, but Bette could have a Coke machine installed to drive her Pepsi heiress co-star crazy, while Joan could wear weights while Bette had to drag her around (both of those stories are absolutely true, by the way). Who else were they going to quarrel with about Oscar entitlements? (And damn, 1950 was sure an epic year for female performances.) Instead of raising all boats, they sunk all ships. Again, the story of Blanche and Jane mimics Bette and Joan (even the names are similar), especially with the twist at the end. Blanche tells Joan, “You weren’t ugly; I made you that way.” If the sisters hadn’t been so jealous and hell-bent on destroying each other, neither one would have been ruined. Bette and Joan, as we know, did all right for themselves, and their efforts, along with Bob’s, helped turn Baby Jane into the gothic classic it’s now considered to be. It was the only time the two worked together, and it was a success. The moments when they come together—when they compliment each other’s acting, for the press or even privately; when Bette listens wide-eyed to the stories of Joan’s horrific childhood—it’s clear that they have more in common than most people ever could have imagined. It’s how Feud somehow skirts the line between comedy, compassion, and camp. Joan’s opposite take to Hedda about the death scene shot on the beach is nothing less than hilarious, as is Bette’s too-impassioned kicking scene. It’s part of the reason we’re addicted to watching these women in the first place: They really are larger than life. Who gets to scream at the top of their lungs at work like that? Who gets to say whatever they like? Who gets to tell off their boss? Who demands to be treated like the center of universe because they really believe that that’s what they are? Feud offers all this and more. For a diehard classic movie fan like myself, I can’t imagine a more captivating TV cocktail. But even on just a human level, it offers life lessons on the most basic connections between people, swathed in a Technicolor-bright palette. We can assume that at some point, on some level, Bette Davis and Joan Crawford both wanted to be good mothers to their children. For Crawford, with the upbringing she had, she had no idea what that would be. Christina found out at the reading of her mother’s will that “for reasons that ware well known to them,” she and her brother were disinherited (a breach hinted at in this episode’s first dinner scene). She then wrote the book that many modern audiences now most associate with her mother. Davis was still alive when B.D. published her own tome, which had the bad timing to come out right after Davis had a stroke, which many found especially cruel. Davis, like Crawford before her, then cut her daughter off without a cent—another parallel in these increasingly parallel lives. This is the first episode without the narration from Joan Blondell and Olivia De Havilland by way of Kathy Bates and Catherine Zeta-Jones. Not sure if we have enough knowledge now, so they’re gone for good?